What would you do if you won a casino jackpot big enough to make your year awesome but not quite change your life? You make sure you have to pay one less bil every month. The game’s afoot as Maarit headed straight to the mobile Vera and John casino, looking for the hottest clues to the biggest jackpots. Thankfully, she didn’t have to look that hard as this gambling site has a whole menu dedicated to its jackpot slot games, telling you how much is in the pot before you even open the game. That said, Maarit didn’t need telling or showing: she knew exactly which jackpot casino slot she’d be playing today. What she didn’t know was that she’d be winning one of the 5 progressive prizes it contains. 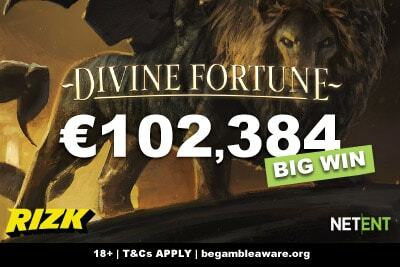 Yggdrasil jackpot slots seem to be popular this month; only a few weeks ago one player walked away with 7.8 million on Joker Millions – the biggest Yggdrasil jackpot win so far. Maarit didn’t quite join the new millionaires club, but that doesn’t make her any less happy with her win. Namely, because whilst she could have chosen a slot with millions in the pot, instead she picked with her heart and went for a game that she actually enjoyed playing… despite the jackpot. 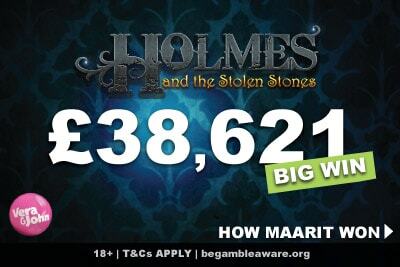 Holmes and the Stolen Stone slot is a 5 reel, 20 payline game with wilds, scatters, free spins and a click me bonus. But what makes it stand out is the 5 jackpots at the top of each reel. They don’t seed huge: 40, 200, 600, 1,500 and 10,000. But they hit often and are specific to the casinos that host the game – so no two Holmes at two casinos would have the same top prize. How do you hit the jackpot? By getting 5 shards of glass in the base game, which triggers the free spins bonus where all wins have a 3x multiplier. Once there, if you manage to get 5 shards matching the jackpots on the top of the reels, you win that jackpot. Maarit won not just any jackpot, but the biggest jackpot of the game. It’s a fun, easy playing mobile video slot, and we agree with Maarit: it deserves more attention than it usually gets. This is more than a decent sum. 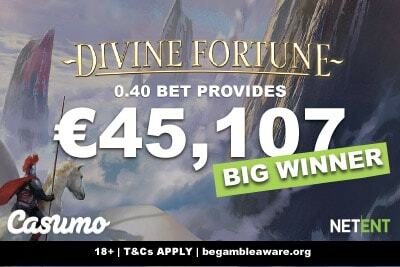 With this kind of slot win, Maarit could afford to take the year off and go travelling, as long as she has a job to come back to after her travels. It’s more than most earn in a year, so is she off to Belize and Tahiti to learn to dive for pearls and make sun hats? Our big winner is (clearly) far more sensible than us because she is doing none of these things. She knows that life goes on, so the best thing to do with the real money she won is make her life a little easier month to month. Maarit bought herself a new car which she was paying off each month. Well, not any more! She paid off her car and now has one less outgoing at the end of the month. Of course, that only took a slice of the pie and there was plenty left over for her to have a little fun. It’s elementary Dear Reader; if you win a big sum of money, remember that life goes on and never change. Maarit certainly hasn’t. Are Vera and John a good casino site worthy of playing? If you haven’t heard of Vera and John before, then we have good news: you are about to find a great new Android and iPhone casino site. And it’s true, they are a great site. 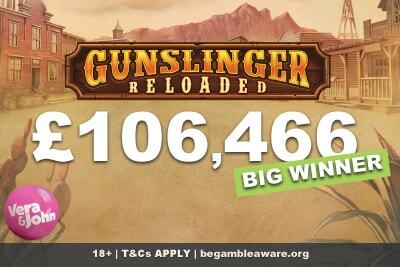 They have a huge selection of slots and games, a fantastic loyalty program and plenty to offer any discerning gambler. Granted, their welcome bonus isn’t as big as some of the other mobile casino bonuses out there, but the offers and service you get once you are in more than make up for that. They don’t need to impress you with fancy welcome offers when they can impress you with daily slot tournaments, great weekly offers, a fantastic service and a beautiful easy to use gambling site. Check them out and we suspect you’ll find your new favourite casino, just in time for some Christmas fun.